Notes: Bob Jacks, piano; Margaret Lashmore and Helen Chaika, vocals; John ‘Corky’ DuChene, John Hutchinson, Bert Trampleasure, Dave Forsyth, John Dugit, saxes; ‘Curly’ King, drums; Murray Carr, Gord Hazzard, Lyle, Stratton, trumpets; Bob Mann, trombone. Jacks’ first orchestra was formed in 1935 while he was still a student at Chatham Collegiate Institute. The seven-piece band included three saxophones, one trumpet, a string bass, a guitar and Jacks himself on piano. Lake Erie locations such as the Erie Beach Dance Pavilion and Rondeau Park as well as dances in Chatham were some of the first entries in Jacks’ engagement book. By the summer of 1937 the orchestra had landed weekend contract at Erie Beach. But, the following year, Jacks’ Chatham-based music interest and his employment based in Wallaceburg led to the breakup of the band. A group of avid young Wallaceburg musicians, eagerly trying to create a dance band, invited Jacks to join in with them. Jacks took over the piano work and soon fronted the band. 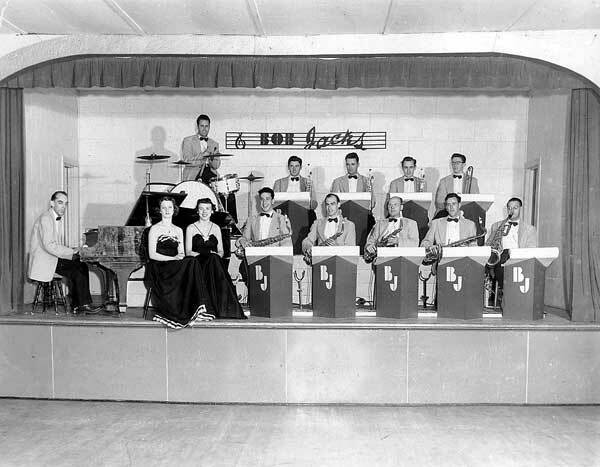 From then on, the Bob Jacks Orchestra became a Wallaceburg fixture. Beginning in 1941, the band played at Primrose Gardens and remained there, steadily, for more than a decade. An accomplished pianist, Jacks gained a reputation as the orchestra leader with the ‘big band sound’. Word soon spread and crowds of dancers came from the surrounding communities and rural areas of Kent County. Eventually Jacks was playing for the Primrose crowd three nights a week. Over the course of nearly two decades more than 50 musicians and 12 vocalists had been associated with the band. During my term with Bob Jacks Orchestra members included (saxes) John ‘Corky’ DuChene, John Hutchinson, Bert Trampleasure, Dave Forsyth and John Dugit; (trumpets) Murray Carr, Gord Hazzard and Lyle Stratton; (trombone) Bob Mann; (drums) Curly King; (vocalists) Margaret Lashmore and Helen Chaika —and, of course, Bob Jacks on piano. Chuck Ross and Doug Wickens occasionally played the string bass in turn. Pete Mitchell sat in on many dances for drummer Curly King, and Tommy Platt played tenor sax in the band when he was in town. In addition to the regular dance schedule at Primrose Gardens, Bob Jacks occasionally booked the band for out-of-town engagements — sometimes renting a bus for the trip. One very special ‘road trip’ took the band to a recording studio in Chatham where the Bob Jacks Trio, consisting of Marg and Dorothy Lashmore and Helen Chaika recorded two numbers — Bless You and Sentimental Journey. Another Chatham appearance was at the well-known radio station, CFCO where the orchestra participated in a special wartime music program. Some of the band’s out-of-town engagements included various Kent County High School and collegiate formal dances, Blenheim and Ridgetown High Schools, the Rondeau Park Dance Pavilion and Erie Beach. Although the majority of Jacks’ road trips were within Kent County, they provided the Bob Jacks Orchestra important exposure in building its reputation as the ‘local orchestra with the Big Band sound’. In 1953 when the crowds at Primrose Gardens in Wallaceburg thinned to the point of slim returns (for Bob Jacks Orchestra and the dance hall proprietor) dance nights were cut back to two a week, then one a week. Along with so many other Swing Era dance floors, Primrose Gardens went down fighting and finally the music went silent and the dance hall went dark. The Swing Era was over. In 1969, a reunion brought many of the Bob Jacks alumni back to Primrose Gardens. A dance was organized and when the curtain opened on the stage the orchestra came out swinging with One O’Clock Jump — and ‘the crowd went wild’! For the rest of the evening Primrose Gardens took a sentimental journey back in time. During intermission Jacks remained at the piano — as he usually did during his years at Primrose — and continued to play many of the old favorites. The air in the dancehall was heavy with nostalgia as admirers gathered around the bandstand to watch and listen to Bob Jacks and his veteran musicians do what they loved so dearly and performed so masterfully. The 1969 reunion provided a brief comeback for the Bob Jacks Orchestra, Primrose Gardens, the dancers and admirers — but, when the final set for the evening was announced, everyone knew, with heavy heart, that the last dance number would be Good Night Sweetheart.